Book Easter, Spring or Summer- Gulf View! 2BR-2BA, 6 pools, 1 heated, 1 Indr. Come visit our family friendly resort. Walk our large beautiful sugar white beach with natural sand dunes and sea oats. Hear the sound of the waves and the call of the sea birds. Enjoy the sparkling blue gulf water and the dolphins swimming off our shore. No streets to cross. 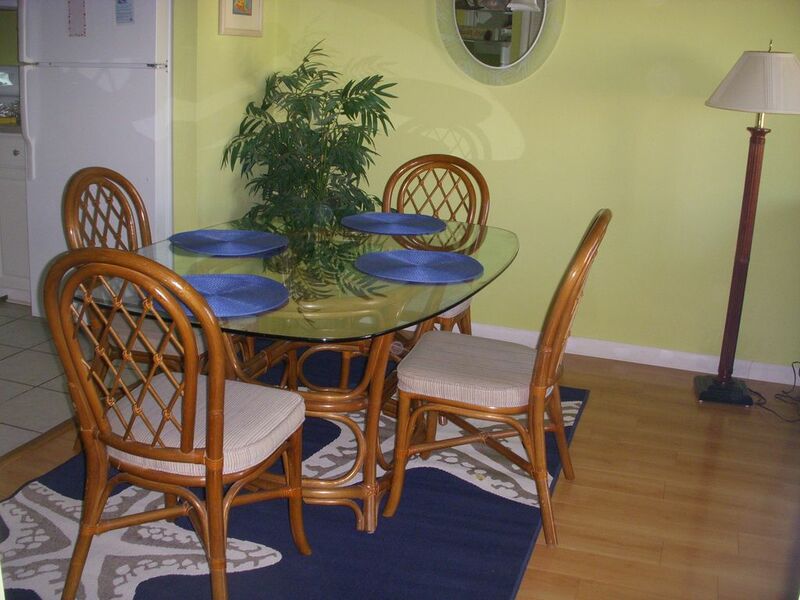 Condos are angled toward the beach and a short walk through the dunes brings you to our beach. Whether you bring your book to read or your kite to fly, our wide, sun drenched beach is the perfect place to spend time. Families and couples will find Gulf Shores Plantation the perfect get-away for a vacation. Snow birds find this a perfect place to escape the long winter with many activities, mild weather, and great food. We have a gated community with 24 hour on-site security. Our second floor two bedroom, two bath unit is cute, clean, and comfortable. The fully equipped kitchen sports white cabinets, appliances, and counter tops that complement our lime green beach décor. There is a queen size bed in each bedroom with a queen sleeper sofa in the living room. There are two flat screen televisions with cable, a DVD/VCR, and a stereo that plays CDs. A wet bar is located off the kitchen. Washers and dryers are right down the hall. Linens are provided with the unit; bring your own beach towels. Towels are provide once not replaced daily. Outdoor barbecue grills are available throughout the complex. WIFI is available in the condo. There are six pools with one outdoor heated pool (early spring and fall)) and an indoor pool that makes swimming available year-round. Our unit is very close to two of the outdoor pools and the indoor pool. Indoor and outdoor spas, lighted tennis courts, new exercise room, sauna, putting green, horseshoe pits, basketball court, and shuffleboard round out a list of activities available at the Plantation. For those who like their food really fresh, fishing off the beach or in Mobile Bay located directly across from the Plantation’s entrance may provide you with dinner. Depending on the time of year, there are canoes, jet skis, parasailing, and beach rentals. World-class Kiva Dunes Golf Course is next door along with their Clubhouse Grille. Kiva Dunes is a nationally ranked golf course. Sassy Bass is open for breakfast, lunch and dinner located at the bottom of the high rise. Uncle Leo's Food truck on premises gives an inexpensive way to stay on site and have pulled pork sandwiches, tacos etc. Sassy Bass restaurant is locted on the premises and serves breakfast, lunch and dinner. Check your calendar and book a perfect Gulf Shores vacation now! Looking for a one bedroom unit? See our listing #325440 on this web site or unit #474950. Our family has been coming to Gulf Shores Plantation for 25 years. The family friendly resort was our go-to for our children and now our grandchildren. Come enjoy and relax at our beautiful beach and pools. This two bedroom condo gives you plenty of room and is close to the indoor pool and the outdoor heated pool. Summer or winter this is a great location. Bring your own beach towels We provide towels for each renter. Daily replacement is not available. Washer and dryers are across the hall. Off the hall behind the domed pool. Access with your pool swipe card. Table is large enough to pull more chairs around the table for meals. Flat screen in living room and second TV in the master bedroom. (6) Pools, One indoor pool. East pool heated mid Feb til warm and Oct. to mid Dec.
Fort Morgan down the street. Enjoyed our stay. Condo was clean and comfortable: good beds. Fantastic beach! Much more remote and quiet than most other places on Gulf Shores and Orange Beach, just what we needed! Glad you enjoyed the Plantation and our condo. Thanks! This is a great place for the family. Lots to do and easy access to everything. Nancy was wonderful to work with. We will definitely be back. Gulf Shores Plantation is a great Family Friendly resort. Glad you found that to be the case! We enjoyed our stay very much. Nancy was a dream to work with and very accommodating. The building is in a great location and has a lot of pools and great beach access. The Plantation has many amenities for renters to use. Glad you enjoyed our pools and beach. Tennis, sauna, hot tubs and a restaurant make this a great destination. Welcome back any time. Great place to stay, our family enjoyed the pools, and beach. Condo was clean great location. Only 10 mins. from Walmart and town. Just a heads up on little grocery store down the road, very over priced it’s worth the 10 mins to go into town and save money.. Highly recommend this resort.. We will be back.. The Plantation has a lot to offer. Happy you enjoyed your stay and our wonderful resort! Everything was very nice and clean. Well organized and very short walk to beautiful beaches. Shopping within a very short driving distance. Food truck's pulled pork sandwich was fantastic. Great owner and communication Overall highly recommend!!!!!!! Happy you had a great time! Welcome back any time. We give repeat customers 10% off the rental rate. Renters must be 22 years or older.